Our first relationship in this world is through the mother. During Navaratri, the Supreme is invoked as the Mother. 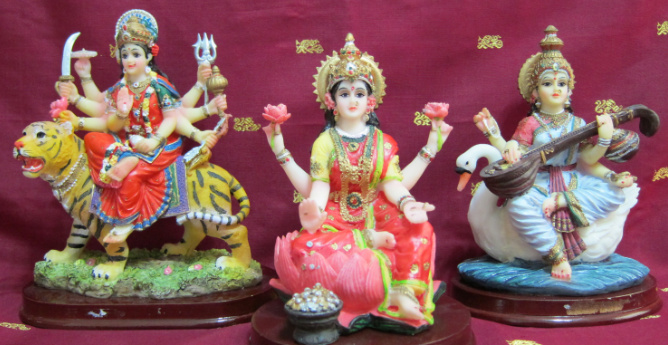 The first three days are dedicated to Durga Devi, the next three days are dedicated to Lakshmi Devi and the last three days to Saraswati Devi. Durga (tamasic aspect) is the remover of impurities, Lakshmi (rajasic aspect) bestows auspiciousness and Saraswati (sattwic aspect) blesses us with Knowledge. "The three Gunas of Sattva, Rajas and Tamas born of Prakrti, bind down the immortal soul to the body in its embodied state." "The embodied spirit, having transcended the Gunas from which the body has sprung, gains deliverance from the miseries of birth, death and old age, and attains to Immortality." The nine day worship denotes the progress from tamasic to rajasic to sattwic. The tenth day is Vijayadashami that signifies victory over the gunas or liberation (moksha). The following slokas can be chanted during the Navaratri. Of course, any hymn/song in praise of Devi is auspicious. But I give below the common ones and which I also have in this blog. I hope it helps. May the Divine Mother bless us all!